Photo caption (top): Members of the UW Health Heart Team pause during a Transcatheter Aortic Heart Valve Replacement (TAVR) procedure, eyes gazing upward at a monitor showing the progression of an artificial aortic heart valve being guided into place. Left to right (foreground): Dr. Tesfaye Telila, Dr. Amish Raval, and Dr. El-Sayed Mohamed. In August, 2017, the UW Health Heart Team celebrated a milestone: completion of the 500th Transcatheter Aortic Heart Valve Replacement (TAVR; also known as TAVI) procedure. At face value, it might appear that this represents a simple story of clinicians gaining procedural skill through dedicated, careful repetition. 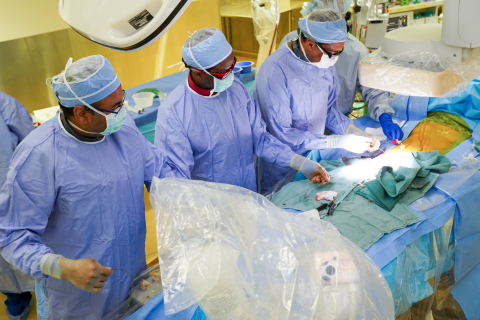 But the tale is far more nuanced: spurred by the advent of TAVR, the field of cardiovascular medicine is being transformed into an unprecedented team endeavor, and UW-Madison is at the forefront of this change. “I don't think there's a more exciting time to be in practice or in training than now. TAVR is a revolutionary treatment,” said Giorgio Gimelli, MD, associate professor (CHS), Cardiovascular Medicine. “Promising minimally invasive techniques are also being developed for other valvular and structural heart conditions. The real change, though, lies in the truly multidisciplinary approach we now take to treat these medically complex patients,” said Dr. Gimelli. “We are very proud of our multi-disciplinary valve team that offers patients an alternative to open heart valve surgery. Our success with the TAVR program has already set the stage for the future development of additional transcatheter treatment options at UW,” said Mohamed Hamdan, MD, MBA, professor and head, Cardiovascular Medicine. 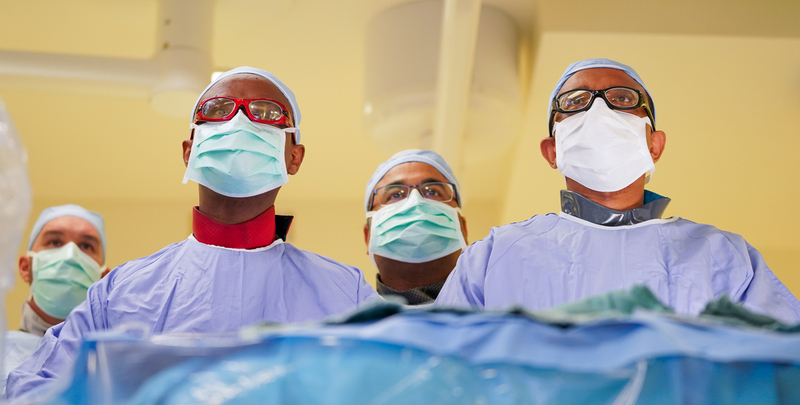 In an interesting aspect, prowess in TAVR procedures at UW-Madison has come full circle. Department of Medicine chair Richard Page, MD, George R. and Elaine Love Professor, served as chair of the initial first Food and Drug Administration meeting to consider approval of the first TAVR medical device. Demand for TAVR is in large part due to the increase in average lifespan in developed nations. Approximately 5 to 7 percent of people above the age of 65 have moderate-to-severe aortic stenosis, a condition in which the leaflets of the aortic valve, which directs blood from the heart into the aorta and to the rest of the body, stiffen and no longer open completely. As a result, the heart works harder than necessary. Patients experience shortness of breath, fatigue, chest pain or pressure (angina), light-headedness, and a feeling that the heart is pounding, racing, or beating unevenly. The prevalence of aortic stenosis increases with age, and discomfort from the condition can limit physical activity and mobility - which sets the stage for weight gain and social isolation. Severe, inoperable aortic stenosis carries an exceptionally low 5-year survival rate of less than 20 percent. While open-heart surgical aortic valve replacement (SAVR) had been a standard of care for more than 50 years, many patients are not considered to be good candidates for open procedures due to advanced age or comorbid diseases. In 2002, the first transcatheter procedure was performed in France: rather than placing the valve using the standard open-heart procedure, an aortic valve bioprosthesis was advanced in position through a blood vessel in the leg. The procedure involved the balloon expansion of a pericardial valve hand-sewn to a stainless steel stent. By November 2011, the Food and Drug Administration approved the first TAVR device for patients with severe symptomatic aortic stenosis deemed inoperable by the heart team. The first TAVR procedure at UW was performed in January 2012, noted Dr. Gimelli. “Following its initial excellent results, UW was subsequently selected as a center for the very competitive PARTNER-2 and PARTNER-3 Trials. These trials evaluated the expanded use of TAVR in patients considered at moderate risk and low risk for surgery, respectively,” he said. Becoming a site for the trials required a different way of going about aortic valve procedures altogether. To achieve this, UW Health established a multi-disciplinary heart valve clinic and began weekly heart team meetings in 2012. If you attend a heart team meeting on a Wednesday morning, you’ll notice that it involves a large gathering of physicians and healthcare providers. 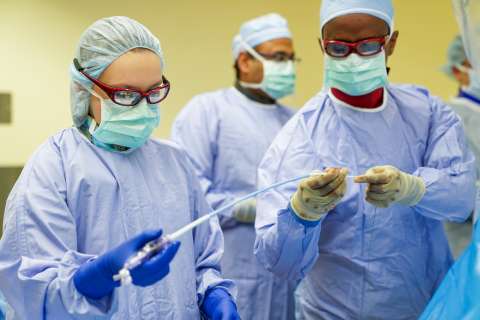 Half a dozen specialties are represented (or more): interventional cardiologists, echocardiologists, cardiothoracic surgeons, radiologists, anesthesiologists, geriatricians, a cardiology coordinator nurse, and rehabilitation specialists all lend their expertise. The cases they are considering on any given week might involve people who are elderly, frail, and/or who have other conditions increasing their risk for surgery. Deliberations might include whether to proceed with a valve procedure, whether a procedure should be open-heart or interventional, and the type of approach. “Those decisions now happen in a more integrated fashion, and involve far more collaboration,” said Dr. Gimelli. High levels of collaboration are also reflected in the leadership roles of nurses at every step, including decision-making. “Our nurses provide exceptional care to this patient population in every phase of their care. Teamwork is essential for success of this program,” said Mary Francois, RN, DNP, UW Health program director. Over the years, the teamwork and group dynamics have become even more refined. “In cardiovascular medicine, we've always had a good relationship with cardiothoracic and vascular surgeons at UW, but our collaboration is taken to the next level when we are scrubbed in, side-to-side, with our hands working together on the same patient,” said Dr. Gimelli. The sea change in structural cardiology is prompting interventional cardiologists to view UW-Madison as a location for additional advanced training. For example, an Illinois-based interventional cardiologist decided to put his own clinical practice on hold for a year to come to UW as an advanced fellow and gain more expertise in treating structural heart disease using cutting-edge technologies. “Increasingly, we see those who have completed their interventional cardiology fellowships return for more advanced training in structural heart disease,” said Dr. Gimelli. It reflects an awareness of the growing demand. Over the next decade, the estimated TAVR growth worldwide is estimated to reach four-fold today’s volume of cases, and the procedure is anticipated be used for a greater number of underserved patients. Experts are also looking for strategies to address health equity issues, because many people living with aortic stenosis are geographically out of range from sites offering TAVR, and patients receiving TAVR are disproportionately (94 percent) white compared to black/African American (3.8 percent), Asian (1.1 percent), or Hispanic or Latino (3.8 percent) ethnicity.